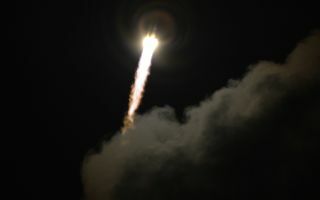 Soyuz VS06, with Gaia space observatory, lifted off from Europe's Spaceport, French Guiana, on Dec. 29, 2013, as seen in this spectacular space wallpaper. Soyuz VS06, with Gaia space observatory, lifted off from Europe's Spaceport, French Guiana, on Dec. 29, 2013, as seen in this spectacular space wallpaper. ESA’s Gaia mission will produce an unprecedented 3D map of our galaxy by mapping, with exquisite precision, the position and motion of a billion stars. This image was released Dec. 19, 2013.